A quick and easy way to start the day Mexican style! Heat a large non-stick frying pan over a medium heat for 1 minute then add the chorizo. Reduce the heat to low and cook, stirring, for about 5 minutes until the fat starts to run from the chorizo. Add the onion to the pan, increase the heat to medium and cook for a further 5-6 minutes, stirring occasionally, until the chorizo is crisp and the onion is just tender. Stir in the salsa and simmer gently for 3-4 minutes, adding a splash of water, if needed. Meanwhile, whisk the eggs and milk in a large jug. Season with the salt and freshly ground black pepper. Melt the butter in a large saucepan over a medium heat. Pour in the egg mixture and cook for 3-4 minutes, stirring frequently until the eggs are just scrambled. Remove from the heat. 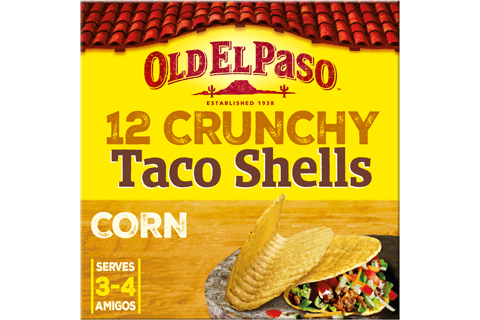 Warm the tacos as directed on the packaging. 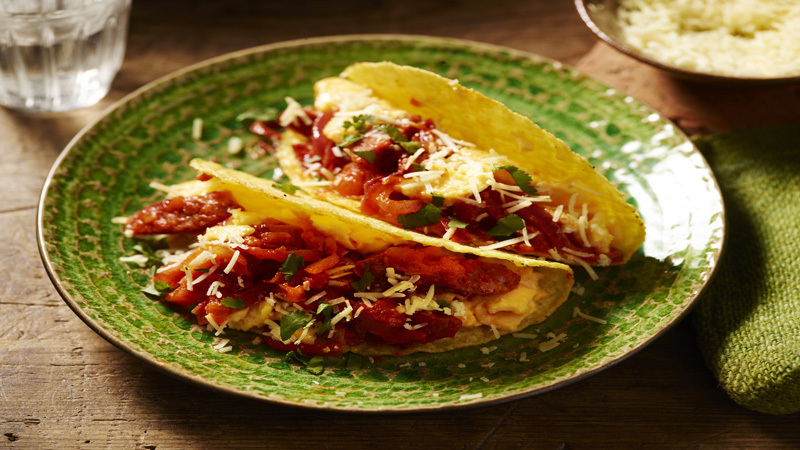 Spoon the chorizo mixture between the tacos then top with the scrambled egg and grated cheese. Serve garnished with chopped coriander. For a spicier flavour add 2 tablespoons of drained and chopped Old El Paso™ Sliced Green Jalapeños or one finely chopped red chilli. Take care not to overcook the scrambled eggs – they will carry on cooking in the hot pan when you remove it from the heat, so cook until only just set.